In the world of beauty, eyes where usually the focal point that all the work would be concentrated on. Making a statement on your makeup usually meant focusing on the eyes. That's now a thing of the past since nails have taken the front seat in the world of beauty. Surely now, the best way to make a statement now is to be expressive with your nails. Nails have taken the spotlight for the past seasons in the beauty world. We focus more of the nails of a celebrity rather than their makeup. But there is a new way to make a statement that's picking up some solid steam and that's by customizing your lips. 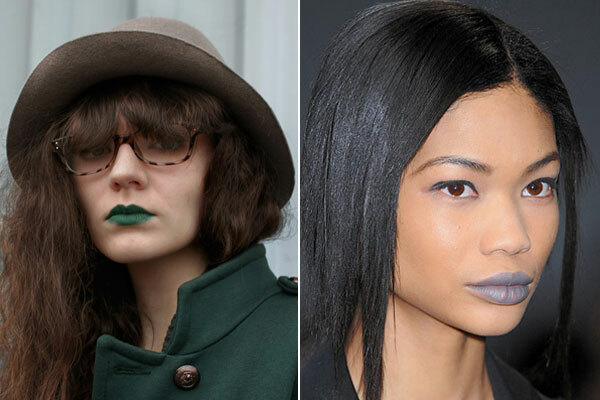 Lips have come a long way and here are just a few trends to show you where it's heading. 1) The Ombre Lips: Wearing more than one color is not new but making it fade is. Just like your hair, you can get an ombre effect lips going to make your makeup pop-out. 2) The Tattoo Lips: Temporary tattoos have been in the market for a long time so it was only a matter of time that temporary tattoos made their mark on lips. Lip tats come in a variety of colors and patterns including leopard and cheetah prints. 3) The Bold Colored Lips: Reds, pinks, nudes, and browns may be a thing of the past! Lip colors are expanding and you will see blue, lime greens, yellows, and other crazy lipstick colors popping up everywhere. We even saw them on the runway this past season and will continue to see them more than ever. Now, it's your turn. Would you be confident in trying these out? Let me know which one you would try and how you would rock it.